On October 11, 1942, the Royal Canadian Mounted Police auxiliary schooner St. Roch arrived at Halifax, Nova Scotia, completing a voyage through the Northwest Passage and becoming only the second ship in history to accomplish that feat. Only two years later, St. Roch made history again, going back through the Northwest Passage from east to west, making her the only ship ever to complete the passage in both directions. With those challenging voyages behind her, St. Roch next sailed south, and in 1950 completed the journey from Vancouver to Halifax, via the Panama Canal, becoming the first ship to circumnavigate North America. For a final feat, in 1954 she returned from Halifax to Vancouver, becoming the first ship to complete (non-continuous) circumnavigations of North America in both directions. Thereafter the humble wooden auxiliary schooner, built for supply duties and never intended as a polar exploration ship, went into well-deserved retirement at the Vancouver Maritime Museum. In 2000, the RCMP patrol vessel Nadon assumed the name St. Roch II and repeated her predecessor's remarkable circumnavigation. She departed Vancouver on July 1st, spent the summer in the Northwest Passage, transited the Panama Canal in November, and returned to Vancouver on December 16th. 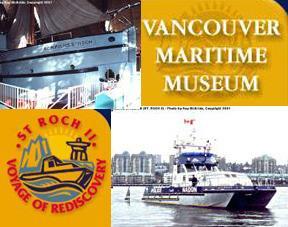 The voyage was organized by the Vancouver Maritime Museum to raise public awareness concerning the original St. Roch, and to begin fundraising efforts to pay for restoration and repairs necessary to ensure her continued preservation. For more information, or to support the restoration of St. Roch, visit the Voyage of Rediscovery website. Special thanks to Vancouver Maritime Museum and photographer Roy McBride for making this photo feature possible! If you have additional photos related to St. Roch and the Voyage of Rediscovery and would like to share them, please send me an email.